Representation Matters, but is it enough? I barely pay attention to superhero/comic book movies unless they are directed by Joss Whedon. So last year’s pre-hype about the new incarnation of Wonder Woman passed me by. I caught the fever this year, however, upon watching the incredible trailer, and feeling that familiar but all too rare thrill of watching the story of a woman in power, a woman owning power, take center stage. It feels good to be able to celebrate and revel in the fact that a movie about a woman superhero, born and raised by a community of women, can hold its own in a male-dominated genre and a male-dominated media. But the moment of triumph, the slight thrill, gave way to all-too-familiar misgivings and rumblings: not only is Gal Gadot supportive of the Israeli Defence Forces (IDF), she used to serve as a combat trainer, making her directly involved in the continued oppression and mistreatment of Palestinian peoples. Does this matter, you ask? Are we not to separate the art from the artist? Can we not appreciate Wonder Woman in the same way that many (myself excluded, in case it matters) continue to appreciate, reward and award the works of Woody Allen, Roman Polanski and Casey Affleck? And doesn’t damning Gadot’s work continue the double standard experienced by artists like Nate Parker and (bare with me, here) Chris Brown? It’s glaringly obvious that whilst some artists who have allegedly been involved in questionable and/or criminal activity are given ‘passes’ and continue to be widely lauded, others, often not white and not male, watch their careers go down in flames. The issue here isn’t that we should be overlooking the fact that Chris Brown is a known dirtbag who, amongst other sins, beats women. The fact is other known dirtbags and open misogynists, like Casey Affleck, should not be awarded Oscars. That they are is an example of their white male privilege at work. So, in light of that, should we not overlook Gadot’s own dirtbag association to the IDF? All of this brings me to another upcoming superhero movie I am hyped about. This time, the story is not a woman’s but it is a black man’s. The much-anticipated Black Panther features a mostly-black all-star cast and, visually, it is magnificent. I can’t tell you what it feels like to watch a trailer for a blockbuster Marvel universe movie and see mostly black actors, knowing that some of those actors have names like Danai Gurira (who is Shona like me) and Lupita Nyong’o (Kenyan). It’s not unlike the thrill of watching the Wonder Woman trailer, but it is somehow so much more. But unlike Wonder Woman, the thrill of Black Panther is not diminished by who is doing the representing but by what is represented. The fictional African country of Wakanda is fabled in Marvel canon as the most technologically-advanced country in the world. In the trailer, however, it is portrayed using the same old tired tropes we’ve come to know as Hollywood visual speak for ‘African’. There are painted faces, African masks, kente cloth, Zulu spears and shields galore. It’s somewhat disappointing. These images are only a handful of what I am hoping will be a feast of diverse visual interpretations of what a modern, technologically-advanced African nation looks like. 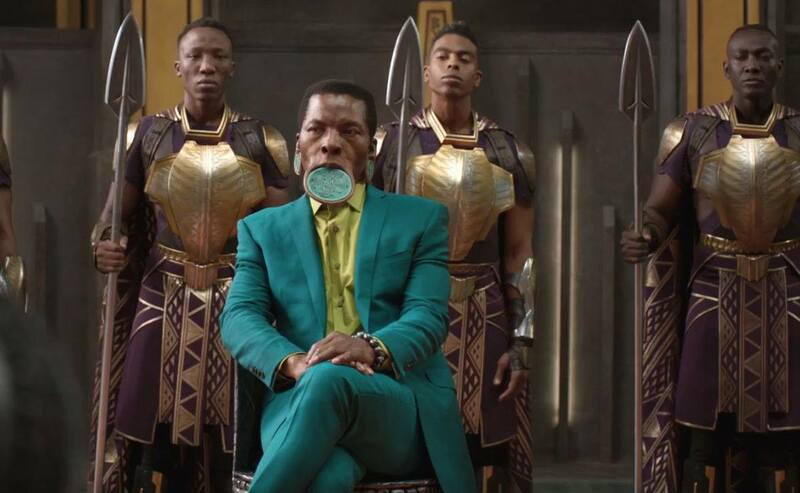 So far, though, the images are more of what those of us who live in real African countries have come to expect from Hollywood’s narrow representations of our worlds. A final and important […] test is being able to work ‘with no guarantees’ […]Working without guarantees is thus becoming aware of the vulnerabilities and blind spots of one’s power and representational systems. It is accepting failure, or put positively, seeing failure as success. The implication […] is that we need to learn to be open, not just, in the short-term, to the limits of our knowledge systems, but also to the long-term logic of our profession: enabling the subaltern while working ourselves out of our jobs. Although this is directed specifically at development workers, I believe it offers some insight to those of us who seek representation of ourselves, the invisible others, in mainstream media. Representers and representations are inherently limited. Their existence is a symptom of a limited society, one in which the only imagery that reflects our reality is stilted and flawed. We won’t see the full intersectional spectrum of feminist identity and feminine power in Gal Gadot’s Wonder Woman: that representer does not carry any sympathy or give any quarter to the silenced and othered peoples who live in her country’s ‘territories’. Indeed, even in Black Panther, this story of African and black excellence and exceptionalism, we will see the same old tired ideas of what ‘African’ looks and sounds like. But the point of the representers is to offer up their failed attempts as further impetus for us to push for our full faces to be seen. We shouldn’t be celebrating Wonder Woman and Black Panther so much as we should be demanding more, loudly and clamorously. These flawed and failed representations are something, but they are not everything. They are a platform but they cannot be the message. What does this mean for those of us paying for our tickets to see these films and hyping them on our social media accounts (guilty as charged)? For me, it means not turning away from sharing and discussing Gal Gadot’s problematic views. It means pointing out that even in a movie featuring actors of African descent, there is still reliance on lazy stereotypes. It means recognising that whilst representation matters, it can never be enough. It means demanding more, and better. We shouldn’t accept these representational crumbs as the triumph at the end of the war, but as the opening of further battlefronts.